The Condor 3000,also known as SE550, is also a very nice rig which is been used by police and fire brigade departments and is nice to experiment with. The UHF version has 2 versions, a network trunking system and a conventional version. The network version can be recognized by the right top button witch has a red square (see picture above). The difference between the two versions is the eprom version and the features inside the rig. The network version is working only by the eprom itself and the convectional version is working in combination with a eeprom, where the channel information is stored. Most of the Condor 3000 available are network type rigs and must be modified for Radio Amateur use. The 27512 eprom must be rewritten with the so called "402" eprom version, and a backup battery must be placed. Apart of this the eeprom must be loaded with software channel information. The special for this purpose written program can be used for this and can be fount op the homepage of PA3EKI as well as the "402" eprom file and many more information. To load the channel information into the eeprom you need a special programmer sledge OR a home made cable witch schematic can be found here. I've programmed the Condor 3000 in such a way that you can go to a specific frequency by typing the last digit of the Mhz and the first two digits from the Khz in the screen. So if i want to go to 433.525 Mhz, i type in 352 and activate. The frequency range of the Condor 3000 is recommended not to excite above 435 Mhz for the selectivity of the receiver and the output deteriorates rapidly, due to the varicaps, witch determents the actual working frequency set by the software, can not handle the specific voltage. This defect is not easily solved and needs specialized knowledge of the rig. 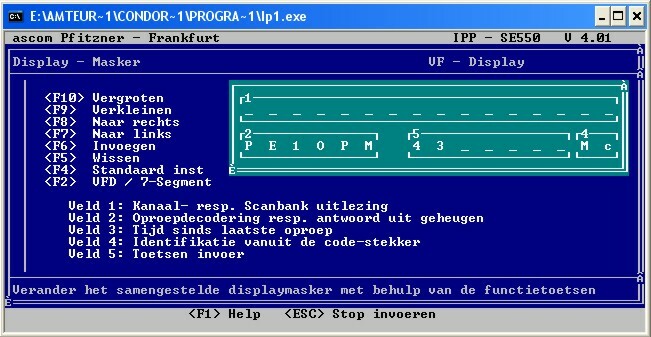 Here are some screen dumps for giving you an impression what can be programmed. This is where you can program the 500 channel's including shift's. This way you can program between 430-435 Mhz 12.5 Khz spacing. Everything is in fase modulation, rather then frequency modulation. The screen of the display lay-out can be adjusted, as the functions of the buttons. There are 9 scan bank's available with 16 positions (channel number). This particular scan bank scans my nearby repeaters. With this rig you can program everything you can think of, depending on what features are inside the rig (CTCSS, ZVEI) and can be used for many things. If there are still questions, you can always e-mail me, and i can try to find a solution to your question. Thanks to PA3EKI en PA0RPA for the information.